FleaVac Home & Pet Flea Vacuum Unit is an all natural, safe and effective way to rid your pet and home of fleas. 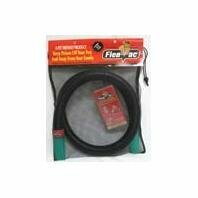 The FleaVac attachment hose was designed to create maximum suction without getting clogged with fur. That's why you don't see a comb or brush attached to the end of the nozzle. It moves freely through fur and suctions fleas as soon as it becomes within range. Because no toxins or harsh chemicals come in contact with your pet you can repeat the process as often as needed. The FleaVac kills adult fleas, eggs, larvae and pupae on your pet, furniture, carpet, pet bedding or any other flea infested areas. FleaVac uses recycled materials whenever possible. FleaVac low toxic kill pellets are completely biodegradable and will not add toxins to the environment when discarded. In addition very little is needed because it is designed to kill fleas inside your vacuum's dirt collection chamber without blanketing your home with poisons. 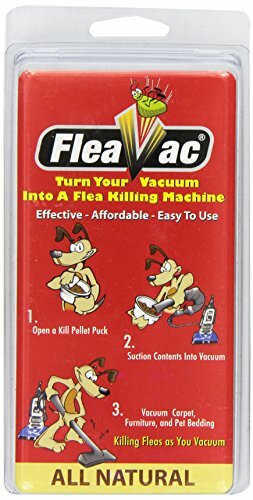 FleaVac Flea Kill Pellets work great in bagged and bagless dirt chambers in vacuums. FleaVac Flea Kill Pellets were designed to utilize well established natural oils that have been used to kill fleas combined with natural bentonite as a holding agent to deliver these natural oils to the fleas. The effect is a lethal combination to fleas. Kill pellets can be used with the FleaVac (sold separately) to kill fleas on your pet or used in a vacuum to kill household fleas. FleaVac Flea Kill Pellets kill all four stages of fleas including adult fleas, eggs, larvae, and pupae. The kill pellets contain no harsh chemicals or pesticides. They are product that is made up of all natural ingredients including; natural clay, geranial, cedar wood oil, mint oit, along with our proprietary blend of other natural ingredients. When Kill Pellets are added to your vacuum chamber, your vacuum becomes a safer, healthier, flea exterminator. Simply vacuum Kill Pellets up and start killing household and pet fleas immediately. Kill Pellets remain effective until it is time to empty your vacuum chamber or change the bag.